Mireth Technology Corp. announced today a new release of NetShred X, its internet track eraser software for Mac OS X. NetShred X version 3.17 is available as a software download or on CD-ROM, starting at $19.95 (US). Mireth Technology Corp. has released version 3.17 of NetShred X, its easy to use internet track eraser that erases internet tracks, such as cache, history and email trash. 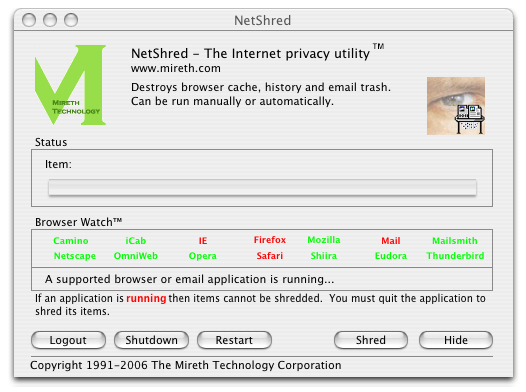 NetShred X runs on Mac OS X. Version 3.17 adds several advanced features including support for the latest versions of several browsers, and cookie shredding.